An irrepressible experimenter with a scientific background, Nan Roche has explored and initiated many polymer techniques. Using some of these same techniques, Roche has created distinctive pieces that integrate her art making with her long time interests in ancient civilizations and other cultures. Historically, the augur, a priest figure who was able to foretell the future through omens such as dreams, natural phenomena, traces of animal sacrifice and the behavior of birds, was an important part of Roman mythology. Roche’s “Animal Auguries” made for the Ravensdale II “Box” exhibition recall the past through their form and implied function. Each vessel is topped with a stylized animal head evocative of ancient Egyptian art. Adorned with polymer beading, the heads serve as lids for hollow cylinders imprinted with mokume-gane achieved patterning that was based on cuneiform and archaic Chinese characters. Each augur rests upon a heavily textured base that mimics basket weave. The limited color scheme, typical of Roche’s palette, enhances the dramatic presence of these pieces. Symbolically, while both the rabbit and the cat are well established characters in Egyptian myth, Roche’s great affection for these two particular creatures grants them personal significance. Intimations of Egypt, Asia, fiber arts, and extinct forms of writing all speak to Roche’s curiosity about other peoples and eras. According to some legends, the cloaked augur would climb to a mountain crest to await signs of the future. Roche’s pair of anthropomorphic vessels, wrapped in languages of the past, stand alert but empty, ready to hold that which remains unknown. Another thematic grouping is Roche’s “Glyph Vessels”. 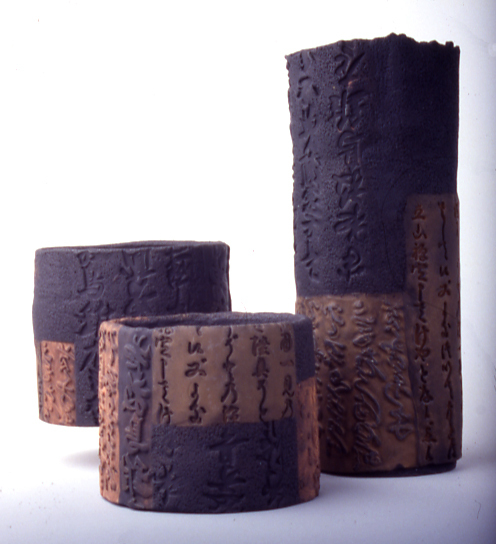 Exhibited at the MIPCES show in 1997, this interconnected set of three containers were inspired by the Japanese idea of “wabi-sabi” which among other traits reveres as beautiful, that which is aged and well used by life. By varying the sizes, Roche adjusted ratios of height and width as translated into tall, medium and short. The underlying forms are covered with assorted panels of textured imprints of stamps that Roche had custom made from texts of obsolete language. As Roche wrote for the MIPCES show booklet, “Since before I could read, I have been fascinated by the lines and patterns of writing so mysterious and remote but somehow so familiar. Running my fingers over these words links me to my human heritage in spirit and mind.” Roche brushed the surfaces with mica powders in an allusion to raku pottery with its random effects of iridescent, metallic luster. The proportions of the language fields and shifts of color highlight the different bits of script and bring them temporarily back into modern life. 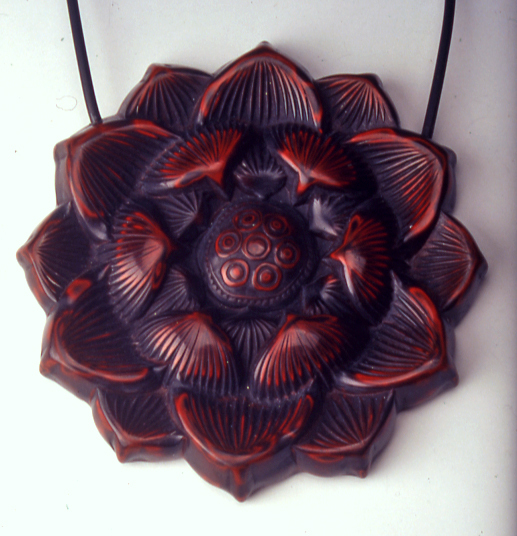 The connection to the mysterious unknown is an important element of Roche’s “Lotus Kashigata Necklace”. Creating a positive image from the negative form of an old, wooden kashigata mold once used to shape Japanese sweets, Roche readily acknowledges the anonymous artisan who carved the mold as her collaborator. As she worked on this piece, Roche pondered the who, what, and when of the mold maker as well as the circumstances around the consumer of the sugary treat. Its cinnabar color suggests both the mineral and the tradition of cinnabar colored Japanese lacquer. Roche used sand paper to reveal different layers of color and the effect of a surface patinated by age and touch. In Japan, the lotus flower is associated with many healing properties. Symbolically its origins come from Buddhist traditions of India and China where it is sacred and suggests purity. Buddha is often seen seated on a lotus flower. Out of this reverie into the past, Roche brings the molded lotus blossom into a new realm which evokes the passage of time, local traditions and the transport of a beloved Eastern bloom into a Western work of art.